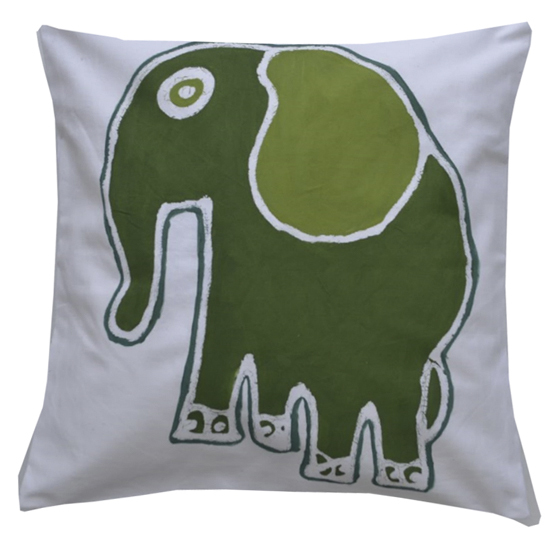 Cotton hand-sewn cushion cover with Tuli motif 'elefant', designed by the Penduka artists. Available in green batik on white cloth and sand batik on cream cloth. Size 40cm x 40cm. Cotton hand-sewn cushion cover with Tuli motif 'elefant', designed by the Penduka artists from the slums of Katutura district, Windhoek. The Tuli motifs are painted on blank sheets of cloth with flour paste, thereby creating lines and figures in the later batik process. The secret of the design is only visible when the dried “dough” is taken away from the fabric. Thanks to the batik product, many vulnerable women are able to get a fair income. Available in green batik on white cloth and sand batik on cream cloth. Size 40cm x 40cm. 100% cotton, machine-washable. For other specific colour/size variants or personalised motifs please contact us.